SAIC’s dynamic Master of Science in Historic Preservation (MSHP) prepares graduates to revitalize the built environment through the comprehensive exploration of science, history, creative arts, politics, and technology. If you are ready to apply to the School of the Art Institute of Chicago’s (SAIC) Master of Science in Historic Preservation program, you will need to first submit SAIC's Graduate Application form and then a corresponding ePortfolio for the Historic Preservation department. You will need to submit an ePortfolio for each additional program to which you wish to apply. All submissions happen via the software SlideRoom. Admission to SAIC is for the Fall term only. 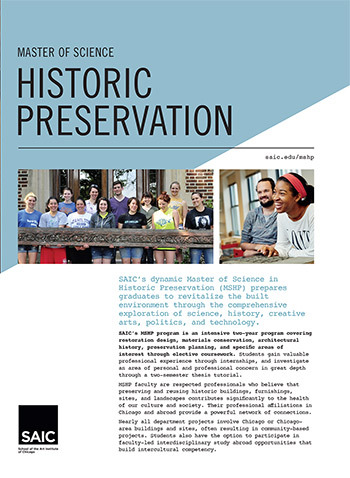 If you would like more information about Historic Preservation in advance of completing your application, you are welcome to contact the Department Chair, Anne Sullivan, at asullivan@saic.edu. Write a 500- to 700-word statement that describes your work or research. Discuss how you came to focus on historic preservation at the graduate level. Also discuss future directions or goals for your work, and finally, describe how the Master of Science in Historic Preservation program is particularly suited to your professional goals. Upload your statement of purpose to the Attachments section of your ePortfolio. All applicants are required to submit a 10–15 page footnoted critical writing sample addressing some aspect of historic preservation or another related academic topic. Applicants with a background in studio art or design may submit an optional visual portfolio of up to 20 images in addition to the critical writing sample. After an initial review of all applicants, the Department of Historic Preservation may contact some candidates for interviews. It is also strongly recommended that applicants have experience in architecture, interior design, or related fields. The Master of Science (MS) in Historic Preservation program at the School of the Art Institute of Chicago (SAIC) is a two-year, 60-credit hour graduate curriculum that prepares students for careers in revitalizing our built environment. Each graduate student in the program completes two years of coursework in each of these areas as part of the required curriculum. The program is geared toward full-time study. Students have a maximum of four years to complete the course work and submit a final thesis. This includes time off for leaves of absences. Thesis in Progress: Students who have not submitted a finished thesis for review and approval by the end of the final semester of enrollment are given a Thesis in Progress grade (IP). All students with a Thesis in Progress grade (IP) will be charged the Thesis in Progress Fee in each subsequent full semester until the thesis is completed and approved and the grade is changed to Credit (CR). If the statute of limitations is reached without an approved thesis, the grade will be changed to No Credit (NCR). A minimum of 54 credit hours must be completed in residence at SAIC. Up to 15 transfer graduate-level credits may be requested at the time of application for admission. No transfer credit will be permitted after a student is admitted. In addition to course work, the two-year, 60 credit-hour Historic Preservationprogram requires students to undertake an internship. The 210-hour internship with a preservation agency, conservator, restoration architect, or designer enables students to work on historically significant sites and to learn firsthand the latest preservation techniques. SAIC's Historic Preservation program has extensive international contacts and offers students significant overseas study opportunities. The Historic Preservation program's balanced curriculum and emphasis on real-world experience prepare students for a wide range of professional opportunities. Our intensive two-year program covers restoration design, materials conservation, architectural history, preservation planning, and specific areas of interest through elective coursework. Students gain valuable professional experience through internships, and investigate an area of personal and professional concern in great depth through a two-semester thesis tutorial. Continue to explore the Department of Historic Preservation’s website to learn more about graduate curricular offerings, faculty, students, alumni, and more or schedule a tour.